20/20 SeedSense is a high definition corn planter monitor designed to monitor, process and display information about the planter and planting process. Seed details are displayed as population, singulation and spacing. Additionally, the system measures and displays row unit down force details. The seed and down force information is processed and displayed in real time, giving growers the opportunity to make in field adjustments to improve planter performance. The system will store the data which can be moved via USB to mapping software giving the opportunity to view the information in map form. This is a great tool to utilize when making decisions regarding future planter improvements. A load sensing pin or link is installed in the depth setting structure and the data from the load cell is processed with a Row Unit Module (RUM). The data from the seed sensor is also routed through the RUM which sends all the information from the row unit through the existing harness to a central Smart Connector. The Smart Connector sends the data from all the rows to the 20/20 SeedSense where the it is displayed in the cab. The Smart Connector based system is utilized when setting up base monitoring, controlling automatic down force via 20/20 AirForce and controlling swath & VR planting with 20/20 RowFlow. Planters have become more sophisticated and can now be equipped with electric drive meters, vDrive, as well as hydraulic down force control, DeltaForce. 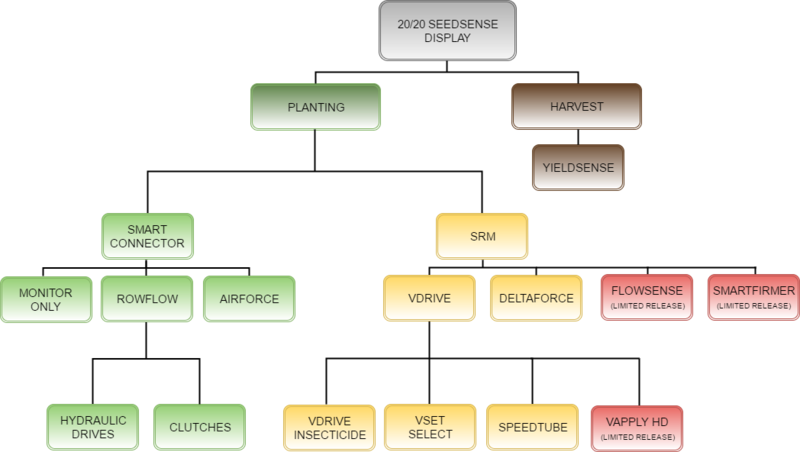 20/20 SeedSense is designed to control these systems as well however, these systems require faster and more efficient communication and therefore Single Row Module (SRM) infrastructure needs to be installed on the planter. Each row will have an SRM installed that gathers and processes the data from that row. Essentially every row becomes an individual planter reacting automatically, in real time, to its own unique environment.